Indian Vegetarian Recipes, easy Indian Recipes: Eggplants stuffed with authentic Indian spices. Stuffed Masala Eggplant is one of the many great Indian vegetarian recipes to make. 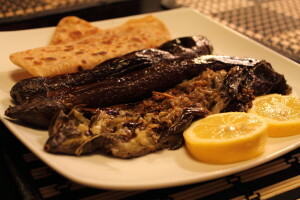 It consists of Indian spices stuffed into an eggplant, then the eggplant is fried. This delicious easy Indian recipe is quick to make. Add the following to a mini chop blender: cumin seeds, coriander seeds, fennel seeds, crushed red chili peppers, sour dried mango powder, salt, and black pepper. Chop then mix the spices. Make a deep sliced cut into the eggplant. Make two more cuts inside the deep cut so spices will mix well into the eggplant. Take the spices and evenly stuff them into the eggplants. It’s really a personal preference how little or how much you stuff the eggplants. Close the eggplant cut with toothpicks so the spices don’t fall out. Warm up the pan. Add the oil. Add eggplants to the pan. If you have any leftover blended spices, you can sprinkle them on top of the eggplants. Let the eggplants cook for 20 minutes. Flip eggplants over. Cook for another 10 minutes. Mash and serve like chapatti or paratha. Looking for another eggplant recipe? Try Spicy Eggplant and Potatoes.